(Newser) – A rhino turned the tables on a suspected poacher in Namibia, reports the AP, charging and injuring the man while he was allegedly tracking it. The incident happened in Etosha National Park after suspect Luteni Muharukua and other alleged poachers illegally entered the wildlife area in hopes of killing rhinos for their horns, the Namibian reported. 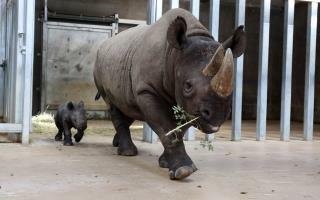 The newspaper said the rhino "appeared from nowhere" and quoted Simson Shilongo, a police officer, as saying the rhino inflicted a severe leg injury on Muharukua after he fell while fleeing. The suspect's friends found refuge for him on a nearby mountain and police arrested him there on Oct. 15, a day after he was injured, according to Shilongo. Muharukua was being treated at a hospital under police guard. The Namibian posted an online cartoon showing a snarling rhino butting a man with a rifle who is already airborne from the blow. "The poacher, poached!" reads the caption. Rhino poaching has increased in recent years in Namibia, which has one of Africa's biggest populations of the critically endangered black rhino. Neighboring South Africa is home to most of the continent's rhinos, including the more numerous white rhino species. Rhinos have been heavily poached to meet demand for their horns in parts of Asia. Some consumers believe rhino horn can cure illnesses if ingested in powder form, although there is no evidence that the horn, made of the same substance as human fingernails, has any medicinal value. Rhino horn is also seen by some buyers as a symbol of status and wealth. it seems after years of being poached, these animals are developing a keen sense of awareness. not only this incident of the poacher being injured,(which he is damn lucky) there is an account of a poacher stalking lions and things went very wrong for him. seems he was the one being stalked when the lions turned the tables on him and attacked him and ate just about all of him except his head and other small pieces. sadly there is a culture which still looks at some species as having these specials healing powers if one consumes a part which is deemed to hold healing powers. before modern medical cracked DNA and genetics codes for living and extinct species, a lot of faith was put into the consuming of certain animal part which held healing powers and were handed down generation to generation. but with the advances in DNA knowledge most of these remedies have been proven not to assist or even remotely have any effect on the ailment being treated. They are also learning how to raise hornless species that are not subject to being poached and killed. A sad indictment of Earth right now.